I didn’t know what to expect, after flying halfway around the world, in terms of beverages. Considering my slightly embarrassing addiction to Diet Pepsi, I was worried that my primary source of caffeine would be unavailable in the Middle East, leaving me a grumpy, jet-lagged bear with a searing headache until the withdrawal pangs passed. Luckily (thankfully, too) The Electrician’s parents know me well, and the beverage necessary for my survival was chilled and waiting. 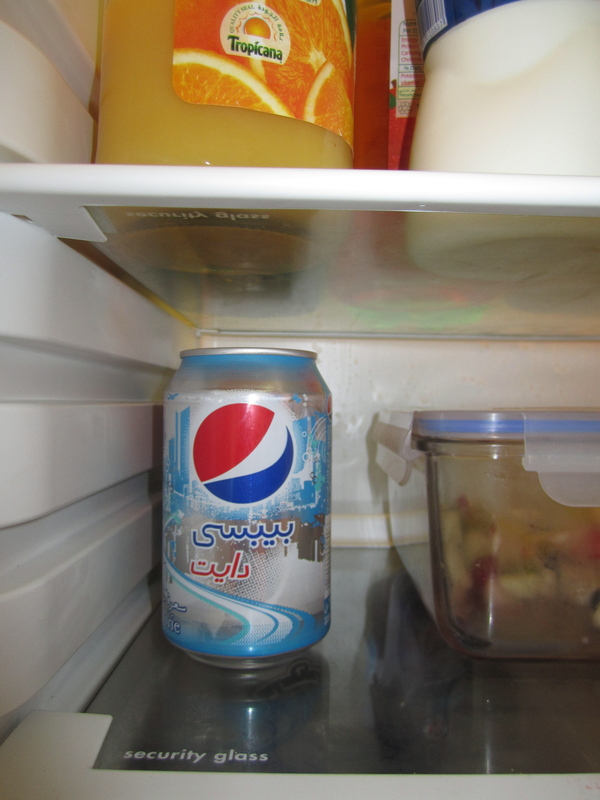 The Electrician’s dad also indulges in Diet Pepsi, so it’s stocked in the apartment in strong supply. The can's a little different, but I'd know that swirled circle anywhere. Because Kuwait is a dry state, the drinks menus at restaurants are considerably different than ones I’m used to seeing. I don’t drink anyway, so I don’t miss the alcoholic stuff. Several additions to the lists, however, are things I could never find at home. Kuwaitis are big on real fruit juice drinks, partly because alcohol is illegal and not commercially available, and partly because the climate here allows fruit to grow well and makes people exceptionally thirsty. So far, I’ve sampled two mixed juice drinks. One, which was my second choice when the mango one that caught my eye on the menu was unexpectedly not available, was called “Peach on the Beach.” Imagine a chilled drink that is the liquid version of those fuzzy peach candies you buy at 7-11 for five cents. Now add a generous splash of grenadine. The result was delicious but threatened to curl my teeth. Next, as a result of the curiosity The Electrician’s mom has stirred up about this favourite local drink, I tried a lemon mint. Look how gorgeous it was on the patio of the fancy golf course where we stopped for tea. I have a spare bedroom that colour at home! 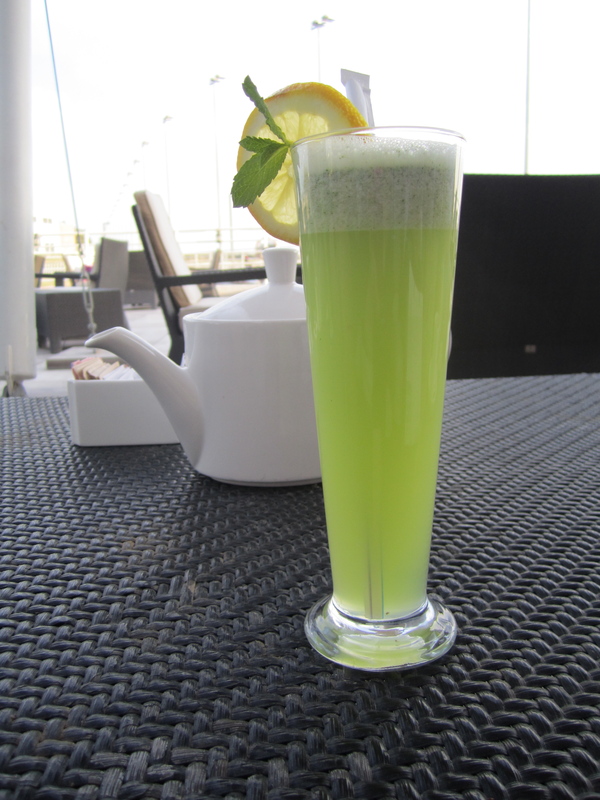 I expected lemon mint to be more tart, and to have more of a mint kick to it. Instead it was a delicious, syrupy thing that tasted like lemon pie filling with only a mild crispness from the mint. I ordered it without ice, since the tap water here is sometimes questionable and I don’t want to risk a very ugly day. When it’s made properly, as the one above was, it’s a blend of macerated mint and freshly-squeezed lemon juice. The person mixing it then adds liquid sugar syrup to the glass, and–in the better places– garnishes it up pretty-like. Apparently, many of the ladies here order their fancy juice drinks with the liquid sugar on the side. I am going to start following suit, or the candy in a glass I am starting to enjoy is going to melt the fillings out of my teeth before I get home. Next Post Mammal Mondays: Welcome to Camel Monday! That is one gorgeous-looking drink! It is making my mouth water! I keep wanting one here. Maybe I should grow some mint and unearth my blender.